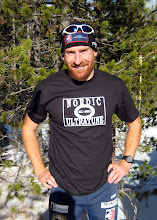 Cross country ski racing for the most part is an individual sport. With the exception of team sprints and relays, the result is based on your own performance. Only one person climbs to the top step of the podium, however there are many people that help the champion get there. Thousands of hours are spent training and many times it is only through the support of your teammates that you can really push yourself to the max. This past weekend my teammates: Caitlin, Matt and I went up to Thunder Bay, Ontario, Canada for the Sleeping Giant Loppet a 50km freestyle race. The race offered a cash prize of $1,000 for first and we were both keen on taking the check home. Matt and I race at almost the exact same level. 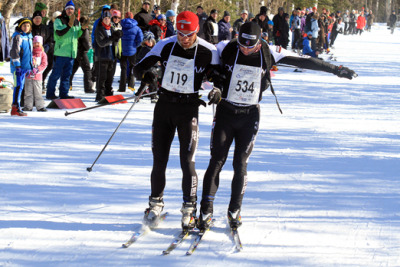 The previous week before Matt and I finished the American Birkebeiner 50km Freestlye race separated by just .40 seconds. We knew it would be a real battle to the finish so we decided to make a pact and work together in the race, splitting the winnings. We were going to share the work of pulling at the front of the pack. Matt even carried a backpack with spare water bottles for both of us. Our main competition were two locals from Thunder Bay who are although semi-retired from racing professionally are very fast. We had raced Adam a few weeks earlier and he beat both of us. 20km into the race Matt and I made our move. Charging hard off of the front of the lead pack and rotating leads until we were out of sight of the chasers. Our plan worked perfectly and Matt and I were able to break away to come in for the win, albeit just 20 seconds ahead of third. Matt is one of my good friends and training partners. Although we are good friends we are still both fierce competitors when we are racing. It is all business from the start gun to the finish line, but as soon as one of us cross the line we are cheering for the other to come in too. It was fun to do a race working and finishing together. Another part of the team that is often not seen when the winner climbs to the top of the podium is the support team: Coaches, Wax Technician, and Feeders. Sometimes it takes doing a race without your regular support crew to realize how great they are. A bit thanks to Jason, Gus, CXC and my many supporters for all your hard work behind the scenes.